NBCOT Navigator™, developed by BreakAway games, has won silver honors in the 2016 International Serious Play Awards competition in the Healthcare category. 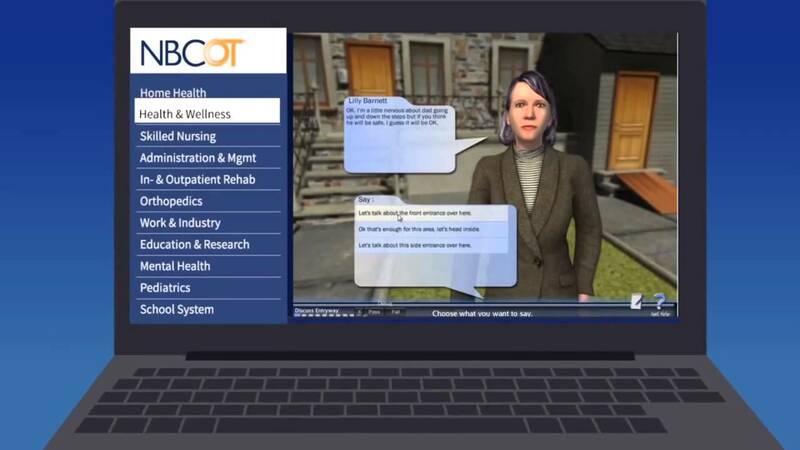 BreakAway partnered with NBCOT (The National Board for Certification in Occupational Therapy) to create an online suite of competency development tools designed to augment and support Occupational Therapists’ professional development. According to NBCOT President & CEO, Paul Grace, NBCOT Navigator is a convenient, interactive and case-based way for OTs to sharpen their skills at any time and continually test their competency against contemporary practices standards. NBCOT Navigator is also designed to help employers facilitate the ongoing professional development and certification process of their occupational therapists and occupational therapy assistants. Employers will be able to direct their staff to the tool suite at any time to measure themselves and test their competency against contemporary practice standards. Through the NBCOT Navigator, players can earn NBCOT Professional Development Units (PDU) using an innovative method to self-reflect, evaluate and develop their own individualized program. Participation in the learning activities on the platform allows players to choose tools that best meet their practice concentration while providing resources to plan their professional development. Players set their own direction and course of study in the manner that fits the demands of their occupational therapy role, schedule and, most importantly, their interests. The NBCOT Navigator is based upon a model that encourages players to reflect individually. As you identify both current and future practice areas, you have the option to select assessment tools which provide immediate feedback regarding your knowledge/skills for a particular setting or population. The platform encourages you to assess your personal performance and thoughtfully consider the preparation of an accessible professional development plan with goals customized by you. The certificant’s profile and responses to a self-reflection questionnaire establish the user’s focus and result in a list of recommended tools for the certificant to take. Upon completion of each tool, rewards and recognition are assigned based on performance, and readings and references are provided as feedback for continuing education. After completing the self-reflection, you are presented with Your Tools list which contains recommended tools that match your areas of interest. This list is customized for your particular situation. You may choose the type of tool that best matches your learning style. To obtain more details on any entry in Your Tools simply select the tool. You can use the tool, remove it from your list, or you can add any other tools to your list. Engaging in this learning process is tailored to your schedule and you may spend as much time on the platform as needed. You simply log out and re-enter the platform as you wish. The entire NBCOT Navigator ™ encourages you to explore your areas of strength and potential future growth. 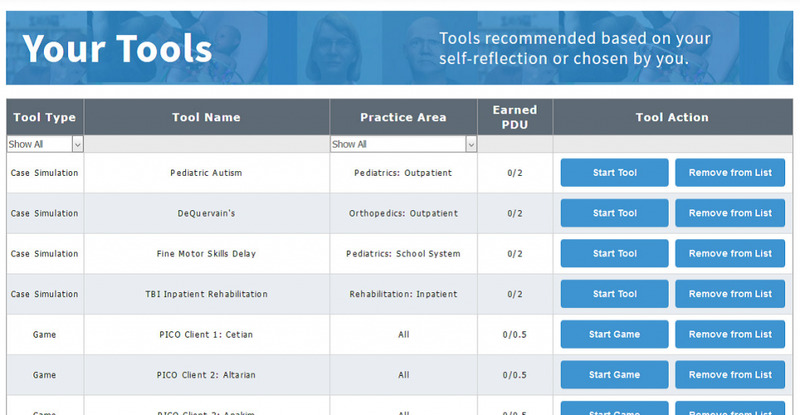 You can also choose to add to your tool list by skipping the self-reflection and making selections from All Tools or from Offerings by Practice Area. The Offerings by Practice Area includes a listing of tools based upon practice areas like Orthopedics, Mental Health, Schools, Home Health, Health and Wellness, Work and Industry, Pediatrics, and Administration/Management. · Mini practice quizzes pose between 15 and 20 multiple choice questions covering all major areas of occupational therapy practice. Each individual quiz focuses on a specific practice area and is supported by contemporary evidence-based practice and current journal articles. 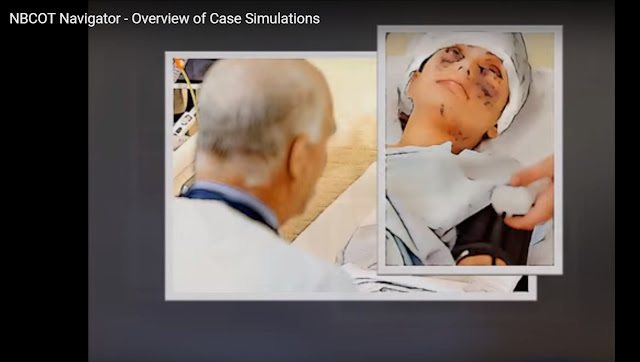 · Case simulations bring occupational therapy practice to life with a focus on clinical reasoning. Each simulation starts with an opening scene providing background information to the scenario. 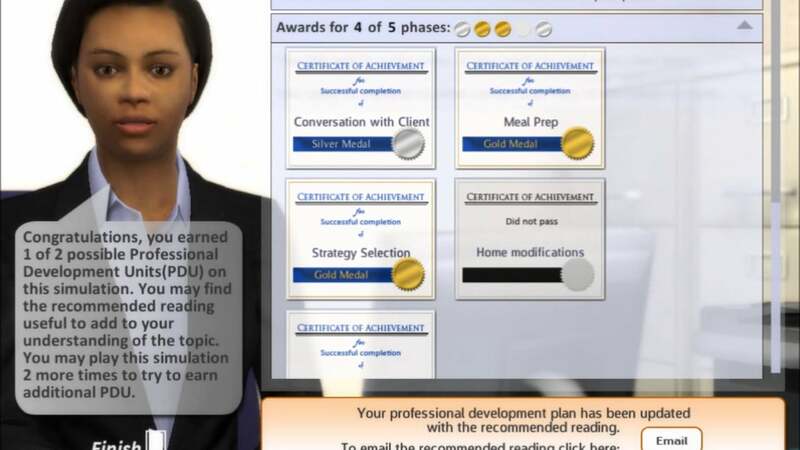 This is followed by a series of modules where the certificant is engaged in performing virtual occupational therapy tasks with a virtual client, including: client interviews and chart reviews, selection of appropriate screening and assessment tools, completion of evaluations, interpretation of assessment results, interprofessional team discussions, intervention planning, provision of intervention services, and discharge planning. · Serious Games offer a more fun and entertaining assessment of specific practice knowledge. Each game is uniquely designed for its specific topic. Initial games include: a stylized matching game called “Balloon Match” covering broad occupational therapy knowledge; an applied evidence-based research game based in outer space called PICO Station; a game where the user becomes a clinic manager called Management Challenge; and specialized skill games including use of physical agent modalities and orthotics. Unlike the other assessment tools, games can be tailored to provide an explicit learning experience.